Both the WholesaleBackup client and server require Microsoft .NET 2.0 to be installed (see this link for more information on why Microsoft will likely support .NET 2.0 indefinitely). It is usually the case that .NET 2.0 is already installed on the computer you are installing our application on. In the event that .NET 2.0 is not installed, you may receive a popup message after install stating "The application has failed to start because its side-by-side configuration is incorrect", or on XP/2003 the application may crash at startup. This article details how to install .NET 2.0 on various versions of Microsoft Windows. Download and install .NET 2.0 from here. .NET 2.0 is installed and activated by default. 1. Open Server Manager and navigate to Manage and add rule and feature s.
2. 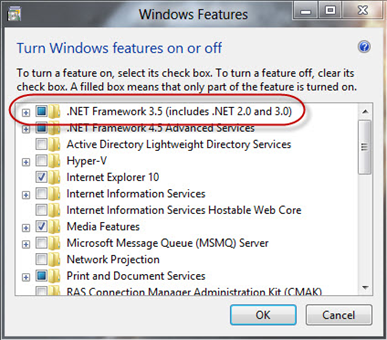 Just click next to Features section and select the .Net framework 3.5 then click Next. On the Confirmation page click the Specify an alternative source path. Then type the path of Windows server 2016 image exactly like below screenshot. 3. 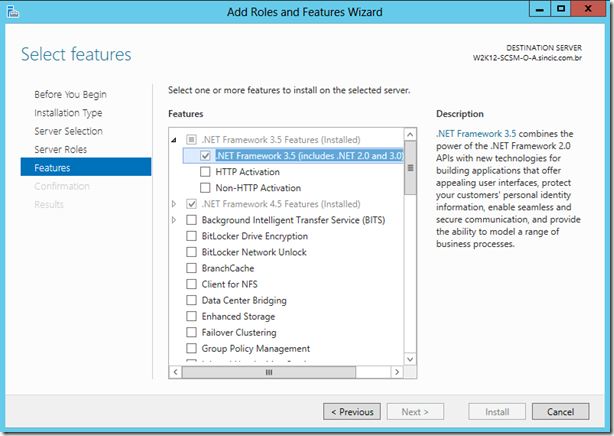 Finally, when the dot net framework 3.5 (includes 2.0) has been installed successfully on Windows server 2016, click Close to finalizing the installation.